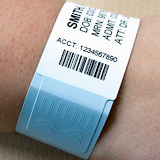 Tyvek Patient Wristbands are made from a synthetic paper that comes in many different colors and is an excellent option for ambulatory patients. They are very lightweight to ensure maximum patient safety and comfort. These wristbands can be used with our polyester labels making a good choice when needing a fast, non-shielded, water resistant hospital wristband. Tyvek Wristbands are applied by simply pulling off a single tab that exposes the adhesive, then wrapping the band around the wrist to a comfortable fit.